Fightzone London’s kids martial arts classes are designed for the young practitioner to excel at the gentle art (also known as Jiu Jitsu). Classes are taught by our head instructor Marco Canha (black belt), Rafael Colonhese (black belt), James Roach (brown belt) and a team of assistant coaches to offer guided progress through the BJJ ranking system, which is attributed to the judgement of the instructor. The students will be assessed regularly during class, being based on attitude, work ethic and understanding of the concepts displayed in class. Fightzone London’s Kids Jiu Jitsu program is designed to welcome 4 – 14 years olds to the philosophies behind Jiu-Jitsu and make the students comfortable with ground work, also known as grappling. Each concept is presented in a playful manner but still with a strong emphasis on technique and development of dexterity. Our regular BJJ kids members are offered a full range of Jiu-Jitsu techniques with an increased emphasis on details. A normal class consists of a Jiu-Jitsu based warm up exercise session, instruction, drilling, sparring and sometimes a game. This class is suitable for the new and experienced young Brazillian Jiu Jitsu practitioners. 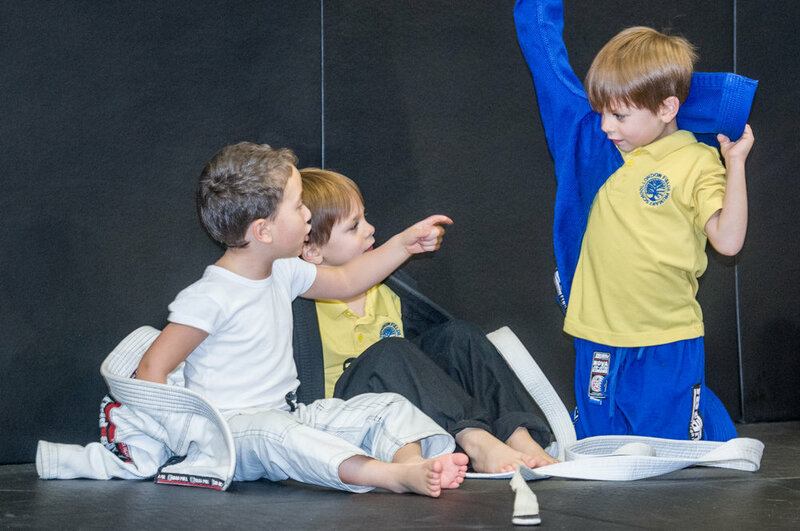 Fightzone London’s Younger Kids Jiu Jitsu program is designed to introduce 4 – 7 year olds to the movements and fundamentals behind Jiu-Jitsu and make the students comfortable with ground work, also known as grappling. Each concept is presented in a playful manner but still with a strong emphasis on technique and development of dexterity. A typical class includes a light exercise session, a few Jiu-Jitsu techniques and a grappling based game. For kids aged over 7 years old our Jiu Jitsu classes offer the full spectrum of Jiu-Jitsu techniques with an increased emphasis on details. A normal class consists of a Jiu-Jitsu based exercise session, instruction, drilling, sparring and games. This class is suitable for the new and experienced young Brazillian Jiu Jitsu practitioners. For your first few classes you can wear track suit bottoms and a t shirt but once you are committed we would recommend your own Gi. Here at the Fight Zone London our Kids Boxing and Muay Thai classes are exciting energetic and fun. In class we work on hand to eye coordination, reflexes and agility at the same time we develop knowledge in basic Boxing and Muay Thai, improve their self confidence, build their physical condition and instil discipline and Respect. Fightzone London kids classes are for children aged 4-14. Participants will learn the same techniques as the beginner adult Boxing and Muay Thai classes (only without head strikes), but the structure of the class is made more fun by turning the basic moves into fun games making classes positive, well disciplined and safe. All techniques and drills are taught using safety pads and do not involve head strikes. Classes consist of drills with and without partners that are designed to improve all aspects of your children’s fitness and technique.